Péche de Vigne by Côté Bastide: This is not a complicated fragrance, but it smells exactly like a freshly cut peach: juicy, but not nauseatingly sweet. It is said to have a hint of apricot, but I can’t smell it. It is a body water, and it comes in a whopping 8 oz bottle for around $38. The lasting power is about what you’d expect from a body water — dismal — but you get lots of it for a reasonable price, so you can afford to splash more on every hour. Very nice for a summer pick-me-up. Peau de Péche by Keiko Mecheri: This is a more serious perfume. It has notes of white peach, orris, sandalwood, and amber wood. As its name implies, this is not the juicy peach of Péche de Vigne, rather, it is a soft, velvety scent meant to mimic the smell of peach skin. It is much drier and woodier, like a smooth sandalwood fragrance with a hint of peach. It is powdery but not overly so. It is reasonably long lasting and stays close to the skin. I have tried layering the two, but it didn't turn out as I had hoped. The Péche de Vigne drowns out the Peau de Péche for a time, but then it mostly disappears and the Peau de Péche smells about the same as it did on its own. Have a favorite peach? Please comment! Note: image is peachy [cropped] by Darwin Bell at flickr; some rights reserved. My mother and VictoriaF are both big fans of the Cote Bastide peach. It is delightful. Doesn't the new Bond Chinatown have peach blossom as a topnote? I can imagine that it is outdone quickly by the rest of the composition, but, again, don't know. Have you tried it, R? I'm not usually a peach-wearer, either, but I'm really charmed by i Profumi di Firenze's Florentia 24. It's a sweet-but-not-cloying blend of white peach, lilac, and iris. I'm glad that I tried this one, because I was so pleasantly surprised. Perfect for spring and summer! Morning L! I am waiting for a sample of Chinatown. Hope I love it, I am already attached to the lovely bottle if you know what I mean. Are you still on crutches? Isn't that one 22, or do I have my numbers mixed up? It is too hard to keep track when they give them such similar names. Anyway, the one with peach was my favorite of the 3 too, very nicely done, and wish I had thought to include it above. Hello R! I dislike both the first with a passion – really not for me. I really love eating peaches and the only peach perfume I kinda enjoy wearing is Clive C's X.
Hi there! Yes, I'm still on crutches but hope to be able to use them much less, as of Friday when the hardware comes out of my feet. Well, the screws are staying, but the staples go. Sorry you asked? I hope I like Ctown, too, because I preordered it from beautycafe. Cavie told me she'd take it off my hands if I didn't like it, or something to that effect. I don't intend to hold her to that, so if you're reading this, P, don't panic! I haven't been out of the house for a week and am going slightly bonkers. I can't stand up to paint so am doing the odd drawing. Sorry to be so OT. L, my Mom had serious foot surgery, in fact several surgeries, so I have actually seen staples in the toes. I am trying not to think about it. I am simply shocked at how many people have ordered Chinatown unsniffed — although I did order the Fragonard Cerisier en Fleurs unsniffed, so who am I to talk. In my own defense, I am splitting the bottle and it is dirt cheap. Hope you love the Chinatown, and hope you are on your feet again very soon!!! N, I tried the CC X, but I was so distracted by the price that I'm not sure I gave it adequate consideration as a fragrance. I should try it again. I love the Cerisier en Fleurs, poysonally, so I hope you like it, too. It may be a tad sweet for you, but we're talking cherry and orange blossom, so whaddya expect. That Ctown bottle is just so gorgeous—add the cardamom and peach blossom—and I was a goner. Thanks for the good wishes ;D.
In a desperate attempt to find SOME way to use a big bottle of Eau d'Hermes, I started combining it with everything in sight (flowers and fruit): lavender, rose, all types of citrus. Results were good. BUT I added it to Péche de Vigne and it was great. If you have a bottle of Ed'H around…give it a try…you'll get a spicy Middle Eastern peach scent. LOL — I expect very little for the $25 I invested, so I am sure to be pleased, right? Interesting! No bottle, but I'm sure I have a sample and will give that a try. Maybe it will tone down the leather, which was a bit too much for me, although I love the spices. And that reminds me of another spicy Middle East kind of peach: Aqaba, and the lighter version Aqaba Spring. Should have mentioned those above too. Actually, I think I like peaches in perfume, R! :):) Mitsouko and Clive Christian X come to mind. I have not worn Mitsouko in a while, though I love it very much. But I wore X on Sunday. It makes me feel very confident and attractive. Since I am going to be sniffing fragrances this weekend, I will have to test the KM peau de peche. As a matter of fact, I have a sample of peche de vigne right here in my desk drawer. I'll have to pull it out and take a whiff! Love Peau De Peche, but then I love most KMs, I'm so easy. I've been looking at those Côté Bastide Péche de Vigne little bath sachets so long, I might as well just order them too! I guess that clinches it R, I will have to try X again. I am just so offended by the price! Oh, let me know how they are! Have you heard what the next scents KM will release are? I've heard rumors there will be 4 more soon. The price is outrageous, isn't it, R? I stumbled upon true serendipity last year when a wonderful MUA friend actually sent me half of her bottle of X, in the original bottle! Can you believe that? I am truly blessed to know such amazing women! Funny thing–I bought a candle at a local salon for about $15. that smells exactly, I mean exactly, like X! Gotta wonder if those notes are really that “precious” to justify the price. R, as you well know, perfume lovers can be very generous! Now I am dying to know what candle? My favorite scent with a peach top note is Mitsouko. The peach adds a yummy, rounded fruit note to this serious chypre. I know you don't care for Mitsouko. Now I can guess why! You don't care for the peach. It's this crazy little candle in an aluminum container called Cupid's Bliss, Scent of Heaven/Nectar of the Gods. There's a website I see printed on the container. It may give you further details: http://www.tarongawest.com. I saw the candle once at my salon, snapped it up, and have not seen any more of them since then. You could be right, but I don't think it is the peach. Mitsouko just feels so heavy and sad to me. But I haven't given up! I have the feeling that when (if?) I grow up I will love Mitsouko. I know it is a beautiful perfume. Actually I feel the same way about Shalimar — one day, I'll grow into it. Thanks, I am going to look for it! Me too! Love my “X”. I bought a bottle and use it very sparingly. My fave is Ungaro Desnuda. Okay, okay, so it's not just peach in there. But oh that spicy and sweet with the dry wood. It's just brilliant. And Maybe Baby smells quite peachy on me, and I don't care if the edt is as weak as a body spray! I don't care if it's not particularly sophistacated, either, because it's kind of not. Nor do I care that everyone and their dog is probably wearing it. But I still like it. Looks like I am outnumbered! I think I am not only put off by the price, but I'm also mad at Clive Christian for buying Crown and then discontinuing most of the line. Maybe Baby didn't work for me, but haven't tried the Desnuda. Love dry wood, so will add it to the list, thanks! Thank you for helping me to get here! A long, but worthwhile journey. Those peach fragrances sound delightful. 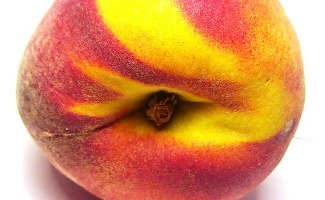 I am not a peach lover, but you have made them sound so invigorating and refreshing for summer. I love peach! Floret smells like canned peach juice but better on me. I also have Maybe Baby but that smells more like apricot. Sali's Pink Manhattan is another beautiful peach I just adore, the French vanilla in there is really amazing and it compliments the peach in such a unique way that any other type of vanilla would not have done. I have a sample of Floret but haven't tried it yet. Canned peach juice doesn't appeal to me though! Sali's perfume is lovely, and I hope to review it next month. i found keiko mecheri to “slim”, almost boring, it did not last long also. but it is fruity without beeing artificial, very delicate, i think “peau de peche” describes it 100%. i gave up at half a bottel and sold it. i felt like it is for a fair, blonde person, and thats what i am not. It is a very delicate scent…and now realizing it's been ages since I smelled it, must pull it out again!